Listen in as book cover artist and fiction writer develop a fantasy cover. We work with several terrific artists and lots of talented writers, and one of the most fascinating aspects of publishing for me is the design and creation of the book cover. Arguably, a cover is huge – in fact, most will tell you it is the biggest factor – in marketing a book online, so we all spend a great deal of time finessing cover design and message. We email, we chat, we Facebook and send images back and forth. Every speck of color carries a purpose on a book cover, every word stays on message. Artist and Writer come together in the best of teams in development. 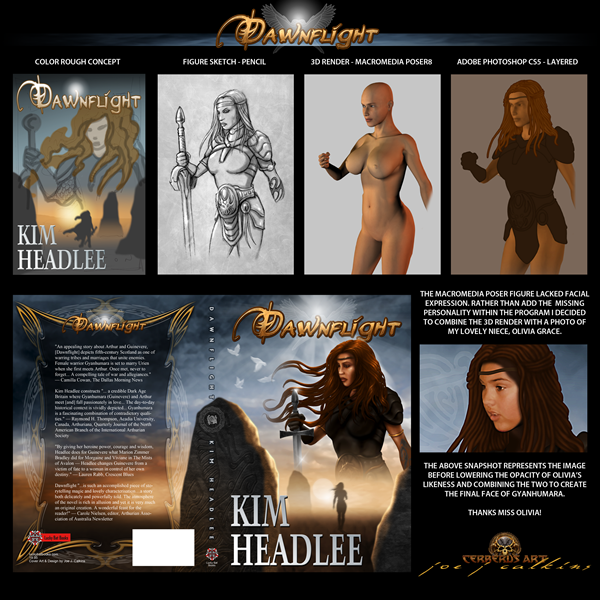 Joe Calkins, who has designed covers for Lucky Bat Books and others, recently sent us the graphic here to show the evolution of the cover of Kim Headlee’s upcoming book, Dawnflight, to be published by Lucky Bat Books. We all loved a brief peek into the artistic process, so I thought you would, too. And here are brief excerpts of the conversation among us all that shot back and forth across the Internet as Joe created the cover and Kim worked with him to express the theme of her Arthurian romance. Joe Calkins: The first thing that comes to mind for a cover layout is to combine elements of the two examples you sent. Something similar to the silhouette of the figure and the stones could be at the bottom of the image with a more close up view of the female warrior on the top, maybe from the waist up with her lower half fading into the sky of the image on the bottom if that makes sense. I’ll work up a rough comp and send it over. Kim Headlee: More details, while I’m thinking about it. Her armor is hard ebony leather; no chainmail. The breastplate would have shoulder guards along the lines of football pads but is otherwise sleeveless. Gloves are appropriate but perhaps not as long. She wears a gold torc around her neck and on both biceps. The finials on the torcs represent her clan’s symbol, the mourning dove. Her cloak is pinned with a gold dove brooch. Her right forearm has dark blue tattoos of a pair of mourning doves in flight. … by the end of the book she gets a dragon tattooed on her left forearm. Judith Harlan (publisher on the book): The title and author name placement—very cool. Nicely done. Nicely weighted. I do like the shadow image walking away—though, just a forewarning: to the uninitiated eye (mine) the shape could be both a woman in a cape and a woman – of sorts – being carried on a man’s back. Kim: RE: The silhouette. ROFL! Yes, I do see that now. I imagine that can be easily fixed by having the hair & cloak hem appear less “ragged” looking. But, yeah, there’s an arm there, and a couple of legs. How funny! Kim: RE: Her hair. Great color. Making it look braided rather than like dreadlocks would be perfect! I also like her skin coloring, though the bright spot on her chin seems a tad large. Joe: Glad you like the color. I plan to go in and add detail to each braid including frayed-looking ends. What would the braids be tied off with? Joe: Awesome, tell your daughter thanks! Regarding the braids, I think depicting them looser is more dramatic and to the subconscious they help the eye along a circular path around the image. The eye is drawn first to the face and then in a clockwise motion down to the standing stones and back up – at least that is the intent. I think the direction the braids are flowing helps to reinforce that style of layout, so if you’re OK with them I think I’ll leave them for now. Kim: Ha, yes, now that you mention it, I do remember my Art Appreciation classes. Won’t admit how long ago…! 🙂 I’m fine with the “flow” of the hair. On closer inspection its color seems more blond than red; it’s hard to tell on my laptop. If you can make it redder (and it still looks good), that would be great. Joe: Sounds good! I’ll get to work on those adjustments and send another proof soon. And that’s all there is to it. Well, that, and discussions on the rest of the character image and fonts and styles, which you may notice in changes before this, the final, version. Thank you, Joe and Kim. It’s a pleasure to see talents working across skills & talents and coming up with something greater than its parts!